This route, across the NE side of Mt. Olympus, crosses three major glaciers and requires mountaineering skill, roped travel, and crevasse-rescue knowledge and equipment. Allow at least a full day for this traverse. "Blue bags" for human refuse are required for glacier travel in this area. On the east end, this traverse can be linked with BR6 (Mt. Ferry to Queets Basin) or BR7 (Queets Basin to Elwha Basin). See the published Climbers Guide for detailed approach information. From Dodwell-Rixon Pass, descend NW 400 ft. on easy open slopes. Cross the Queets River at 4400 ft. to avoid the deep chasm below. The route is just below the steep slopes of the N rim of the Queets Basin. Continue down WNW to just above a small bench at 4200 ft. This spot is 0.3 mile NW of Peak 4478. Ascend W 200 ft. through a steep open meadow swath to directly below the base of the last cliff band of the Queets Basin rim. A good game trail leads below cliff bands and through dense trees at 4400 ft. The trail goes W, ascending 200 ft. in 0.1 mile, and takes you easily through some difficult forested terrain, opening out in more moderate mixed forest and meadow at 4600 ft. Continue traversing at 4600 ft. NW for another 0.1 mile and go around the forested ridge, staying above steep, dense forest. It opens out in meadow. Ascend N 200 ft. over meadow and open terrain (no trail) to the S end of a beautiful hidden basin at 4800 ft. Navigate through this basin to the NW corner of it, staying above the top of the deep canyon of a tributary of the Queets River, which is shown on the USGS map. Begin descending SW, staying near the canyon to the E. Look for a good game trail at 4650 ft. Follow this game trail, descending SW through dense forest over the rounded ridge. The trail angles W, dropping you into the snow-filled gully of the next tributary of the Queets at 4200 ft. Traverse at this elevation 0.1 mile SW through a few small gullies and rocky terrain to the next tributary of the Queets, which is the N drainage of the Humes Glacier. Follow this river upstream to the headwall below the Humes lacier terminus. A fat spot below the headwall marks the start of the best route up to the terminus. Head up SSW 100 ft on a mossy, rocky meadow, then ascend slabby rock ledges W 200 ft. up to the terminus. Ascend the glacier to Blizzard Pass, which separates the Humes and Hoh glaciers. 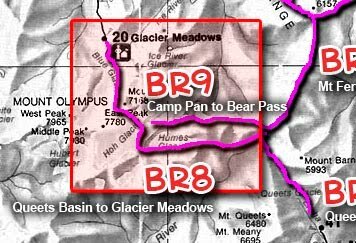 From Blizzard Pass, descend NE on snow, W of Peak 6533, then steep snow NW to Camp Pan. From Camp Pan, drop SW onto the Hoh Glacier. Difficulty on the Hoh Glacier will depend on the time of year and may vary from one year to the next. Cross the Hoh Glacier to the W and climb to Glacier Pass, which is S of Peak 7156 (Mt. Mathias). From Glacier Pass, descend the Blue Glacier on moderate slopes. Ascend the steep lateral moraine at its upper end and follow the trail on top of the moraine 1 mile down to Glacier Meadows. Camping on the moraine is no longer allowed. An alternate route off the Blue Glacier is on the NE side, near the snout, where a trail joins the main trail to Glacier Meadows.